What is it? 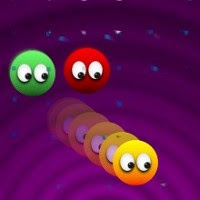 – Ballies is an extremely colorful action game where you control a googley-eyed, yellow “bally” who must destroy all of the incoming "ballies" using bombs and power-ups. Who made it? – The game was developed by Dave Munsie of JGOWare, also the developer of the excellent shooter, Retroshoot. How does it play? – The game is a surprisingly addictive combination of mouse-avoidance and light shooting elements. You move your “bally” around the screen with the mouse, attempting to eliminate the other ballies of various colors as they approach from all sides. The background will periodically change colors, and you can simply collide with ballies that match the background to destroy them. Crashing into any other color ball will cause you to lose a life. Your primary method of “ballicide” is bombs. Bombs are placed by clicking the left mouse button, and you’ll have a limited number for each level. They’ll detonate after a couple of seconds, blasting all ballies within range. You’ll be able to collect various power-ups, like those that freeze all enemies or detonate all ballies of a single color. Presentation – The game has a simple visual style, with bright colors and overall cuteness that may have you reaching for insulin. A good use of particle effects also spices things up. The music is upbeat and catchy, and may even get stuck in your head. Positives – The mouse-driven controls and simple play mechanics make it really easy to get started. There’s just enough of a variety of power-ups to keep things from getting old too quickly, and blowing up the rival “ballies” is surprisingly satisfying. One quick play session can turn into two or three before you know it. Negatives – The background will often change color when you least expect it, making colliding with like-colored “ballies” a sometimes-dicey proposition. Having the background change right before you collide with a rival will often result in the loss of a life. Why you should play it – Ballies is easy to play, and hard to put down. It’s pure visual sugar, and is great way to spend a fifteen minute break.